French in the Primary Classroom is an ideas and activities resource for primary teachers and teaching assistants, regardless of their linguistic competence or prior experience of language teaching. Angela McLachlan presents a resource bank of games and activities to enhance the teaching and learning experience, to engage and motivate the young learner, and to promote sound language learning in the primary classroom. 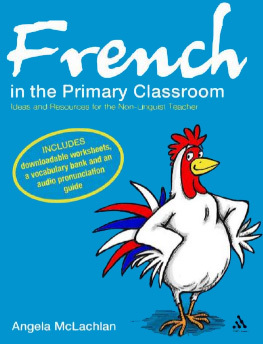 French in the Primary Classroom has been developed for teachers who are delivering MFL lessons to primary school children (5 - 11 year olds). It is suitable for both specialist and non-specialist teachers.